This directory lists leading earthworm growers in the United States and Canada, with names of owners, types of worms sold, and related items -- whether wholesale or retail -- and other pertinent information. Regarded as an almost indispensable book for wholesale and retail earthworm buyers, this book will help you find dependable sources for exactly the kinds and types of earthworms wanted in the most conveniently located areas. This directory stopped being produced back about 10 years ago. There is an online directory that you can use for free at http://www.wormfarmdirectory.com/. Feel free to add your worm farm, bait farm or other worm related business, or just use it to find supplies and products. 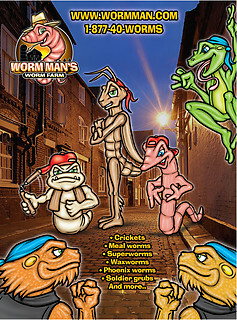 The original guide above listed all insect farms and so does this directory, and it is free to use and is not only for redworm composting.